The Nottingham Post was the biggest faller in the regional evening newspaper market in England in the second half of 2011, with year-on-year sales down 17.2% to 33,940. Sales fell 4% compared to the first half of 2011, according to the latest Audit Bureau of Circulations figures published on Wednesday. Stablemate the Leicester Mercury reported a 10.4% year-on-year fall in circulation to 48,457, a 5.3% period-on-period drop. Johnston Press's Yorkshire Evening Post saw sales fall 10.9% year-on-year to 34,851, a 4.5% fall compared to the previous six months. Trinity Mirror's Evening Gazette in Teeside shed 5% of its circulation year on year, to 38,606, down 4.8% period-on-period. Stablemate the Liverpool Echo dropped 6.5% year-on-year to 81,506, a 4.6% decline period-on-period. Trinity Mirror's part-paid part-free Manchester Evening News dropped 7.2% period-on-period and 9.5% year-on-year to 84,462. Paid circulation accounted for about 57,000 of total circulation. Most of the UK’s regional newspaper websites saw strong traffic growth in the last six months of 2011, according to figures released today by ABC. The big four regional publishers also took the top four spots in terms of group web traffic. Trinity Mirror was top with average daily unique browsers in the period of 469,707 (up 12.2 per cent year on year), next was Johnston Press on 452,380 uniques a day (up 13 per cent), Newsquest had 449,121 a day (up 13.6 per cent) and Northcliffe had 302,463 (up 5.4 per cent). The Johnston Press-owned Scotsman.com was the most popular individual regional press title in the second half of 2011, with 94,605 unique browsers a day according to ABC (down 2.6 per cent year on year). The website of the Manchester Evening News was in second place with 82,193 browsers a day (up 26.1 per cent), followed by the Wolverhampton Express and Star on 44,786, up 32.8 per cent year on year. Call it creative if you want, but this is what economic destruction looks like. 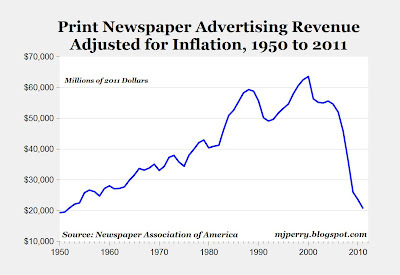 Print newspaper ads have fallen by two-thirds from $60 billion in the late-1990s to $20 billion in 2011. You sometimes hear it said that newspapers are dead. Now, $20 billion is the kind of "dead" most people would trade their lives for. You never hear anybody say "bars and nightclubs are dead!" when in fact that industry's current revenue amounts to an identical $20 billion. So the reason newspapers are in trouble isn't that they aren't making lots of money -- they still are; advertising is a huge, huge business, as any app developer will try to tell you -- but that their business models and payroll depend on so much more money. The U.S. newspaper industry was built to support $50 billion to $60 billion in total advertising with the kind of staffs that a $50 billion industry can abide. The layoffs, buyouts, and bankruptcies you hear about are the result of this massive correction in the face of falling revenue. The Internet took out print's knees in the last decade -- not all print*, but a lot. Don't just blame the bloggers. For decades, newspapers relied on a simple cross-subsidy to pay for their coverage. You can't make much money advertising against A1 stories like bombings in Afghanistan and school shootings and deficit reduction. Those stories are the door through which readers walk to find stories that can take the ads: the car section, the style section, the travel section, and the classifieds. But ad dollars started flowing to websites that gave people their car, style, travel, or classifieds directly. So did the readers. And down went print. The decline is stunning. "Last year's ad revenues of about $21 billion were less than half of the $46 billion spent just four years ago in 2007, and less than one-third of the $64 billion spent in 2000," Mark Perry writes. In the next few years -- and hopefully, in the next few decades (I like print!) -- we'll see papers and magazines continue to invest in their websites and find advertising and pricing models that support journalism independently. Otherwise, one hopes that rich people continue to be fond of paying for the production of great writing on bundles of ink and paper. Google has confirmed a new Panda update at the same time that it’s announcing 40 search updates that happened in February (or are in progress right now). This sounds very similar to Panda 3.2, which happened in mid-January and was described only as a “data refresh” and not related to new or changed ranking signals. Panda was launched a year ago — don’t miss the full background in our recent story,Infographic: The Google Panda Update, One Year Later. We’ve reached out to Google in the past, asking for further clarification on the items in these monthly roundups. The company has indicated that the blog post says everything Google wants to say. That, along with Google’s understandable (and necessary) reluctance to give away too many details about ranking signals, leads me to assume we won’t be getting anything more than the above about this. A link evaluation signal that’s been used for years is now turned off? The SEO mind races…. Traditional SEO has played a bigger part in Google’s local search since the launch of Places Search in late 2010. And now it sounds like that dial is being turned up a little higher, too. There are also several updates related to freshness, sitelinks and related searches. Image recognition app Blippar has launched a new service aimed that brands and media owners, which will allow users to buy products features in adverts. The mobile platform, called Blipp to Buy, will allow users to buy products through press or outdoor adverts, as well as editorial within print publications, with partnerships with brands using the service expected to be announced in the coming months. Blipp to Buy has already been trialled with brands such as Tesco, Clinique, ASOS, Domino’s Pizza, IPC Media, Aer Lingus and Future Publishing’s Total Film. IPC Media is said to have received over 200,000 ‘blipps’ through Blippar when it created a special ‘interactive issue’ of Nuts magazine in January. Ambarish Mitra, CEO of Blippar, said: “Brands and media owners have begun to appreciate the potential of our technology to bring their products to life and get immediate engagement from consumers. This is a major step forward in m-commerce and we believe it’s got the potential to become a significant new sales channel for brands across the spectrum, while also creating a new revenue stream for publishers. Do you shove lots of ads at the top of your web pages? Think again. Tired of doing a Google search and landing on these types of pages? Rejoice. Google has announced that it will penalize sites with pages that are top-heavy with ads. Top Heavy With Ads? Look Out! The change — called the “page layout algorithm” — takes direct aim at any site with pages where content is buried under tons of ads. So sites that don’t have much content “above-the-fold” can be affected by this change. If you click on a website and the part of the website you see first either doesn’t have a lot of visible content above-the-fold or dedicates a large fraction of the site’s initial screen real estate to ads, that’s not a very good user experience. Such sites may not rank as highly going forward. Google also posted the same information to its Google Webmaster Central blog. Sites using pop-ups, pop-unders or overlay ads are not impacted by this. It only applies to static ads in fixed positions on pages themselves, Google told me. How can you tell if you’ve got too many ads above-the-fold? When I talked with the head of Google’s web spam team, Matt Cutts, he said that Google wasn’t going to provide any type of official tools similar to how it provides tools to tell if your site is too slow (site speed is another ranking signal). Instead, Cutts told me that Google is encouraging people to make use of its Google Browser Size tool or similar tools to understand how much of a page’s content (as opposed to ads) is visible at first glance to visitors under various screen resolutions. We understand that placing ads above-the-fold is quite common for many websites; these ads often perform well and help publishers monetize online content. This algorithmic change does not affect sites who place ads above-the-fold to a normal degree, but affects sites that go much further to load the top of the page with ads to an excessive degree or that make it hard to find the actual original content on the page. This new algorithmic improvement tends to impact sites where there is only a small amount of visible content above-the-fold or relevant content is persistently pushed down by large blocks of ads. Clearly, you’re in trouble if you have little-to-no content showing above the fold for commonly-used screen resolutions. You’ll know you’re in trouble shortly, because the change is now going into effect. If you suddenly see a drop in traffic today, and you’re heavy on the ads, chances are you’ve been hit by the new algorithm. For those ready to panic, Cutts told me the change will impact less than 1% of Google’s searches globally, which today’s post also stresses. What happens if you’re hit? Make changes, then wait a few weeks. Similar to how last year’s Panda Update works, Google is examining sites it finds and effectively tagging them as being too ad-heavy or not. If you’re tagged that way, you get a ranking decrease attached to your entire site (not just particular pages) as part of today’s launch. If you reduce ads above-the-fold, the penalty doesn’t instantly disappear. Instead, Google will make note of it when it next visits your site. But it can take several weeks until Google’s “push” or “update” until the new changes it has found are integrated into its overall ranking system, effectively removing penalties from sites that have changed and adding them to new ones that have been caught. If you decide to update your page layout, the page layout algorithm will automatically reflect the changes as we re-crawl and process enough pages from your site to assess the changes. How long that takes will depend on several factors, including the number of pages on your site and how efficiently Googlebot can crawl the content. On a typical website, it can take several weeks for Googlebot to crawl and process enough pages to reflect layout changes on the site. Our Why Google Panda Is More A Ranking Factor Than Algorithm Update article explains the situation with Panda, and how it took time between when publishers made changes to remove “thin” content to when they were restored to Google’s good graces. That process is just as applicable to today’s change, even though Panda itself now has much less flux. Due to recent changes to the Google algorithm, namely Panda, it is important to understand how video can help deliver better SEO results. Creating and publishing video is a challenge for the SME due to time and budget constraints but there are some simple steps which ensure you can maximise on the benefits. These days with faster broadband speeds, offering video content on your website is a definite user benefit rather than an annoyance. It can enhance the user experience giving a better feel for what is on offer. If Google cannot discover video content at the URLs you provide, those records will be ignored by Googlebot. Googlebot cannot read the content of the video, but it is smart enough to determine the theme of a video by analyzing the texts of the video page, its caption, titles and more. So, if you have a video on your website and you want it to index accurately by Google video then use smart video captions to describe the content of the video. A Video Sitemap allows website owners to inform Google of the category, title, description, play page URL, running time, and intended audience for each video published on the site. This helps Google know about all the rich video content on the site, which should improve the listing of the site on video search results and most desirably on the blended search. Remember, producing regular videos on a particular topic helps get your name, face and company linked to that topic. Below is the main part of an article from Linkedin about how Google is changing how it returns its search results and, as you will read, it is a big change. For the full article please click on the link at the bottom of the page. Google’s search results are undergoing their most radical transformation ever, as a new “Search Plus Your World” format begins rolling out today. It finds both content that’s been shared with you privately along with matches from the public web, all mixed into a single set of listings. The new system will perhaps make life much easier for some people, allowing them to find both privately shared content from friends and family plus material from across the web through a single search, rather than having to search twice using two different systems. However, Search Plus Your World may cause some privacy worries, as private content may appear as if it is exposed publicly (it is not). It might also cause concern by making private content more visible to friends and family than those sharing may have initially intended. The new format and features will also likely cause Google to come under renewed fire that it is leveraging its search engine to favor its own content and crowd out competitors. Below, a detailed look at what’s involved with Search Plus Your World, from how it works to some of the issues it raises. Google has had personalized results since June 2005, results from across the web that are given a ranking boost because they are deemed especially of interest to someone, based on their personal behavior and interests. Without the boost, these results might not have made it into the top listings for a particular search. Personalized results were expanded and presented in a new way in February 2007. Then, in December 2009, you no longer had to opt-in to receive personalized results. They were enabled by default for everyone, to some degree, even if you weren’t signed-in to Google. Separately, Google has had social search results since October 2009. These are also personalized listings but ones based on the people you know, rather than your personal behavior. They’ve also been given a ranking boost. Initially segregated from “regular” listings, Google’s social search results were blended into regular results in Feburary 2011 and expanded to include not just content created by those you know but also content shared by them through a variety of social networks. With Search Plus Your World, by default, there’s a new “Personal Results” view that appears. The view personalizes the listings you get based on both your own behavior and social connections, similar to what previously happened. In addition, content that’s been shared with you through the Google+ social network now also appears. “The social search algorithm, and the personal search algorithm, and the personalized search algorithm are actually one algorithm now, and we are merging it in a way that is very pleasant and useful,” said Amit Singhal, who oversees Google’s ranking algorithms, when I talked with him about the new features. The arrow on the left points to a message that, in this example, says that there are “50 personal results and 419,000 other results” that have been found. Some of those 50 results will be blended into the first page of results being shown. The second arrow highlights a new toggle that Google has introduced, something that many of those who do search engine optimization have wanted for ages. It allows you to switch between personalized and unpersonalized results. I’ll cover more about the toggle in a bit. When the button with a person icon is shown dark, that means results are being personalized. This is a real life example of how personalized search is working for Singhal. He shared this photo of his dog, Chikoo, on Google+ in a limited manner, rather than with the entire world. The other photos of the dog that you can see, including one from his wife, Shilpa, were also privately shared. Before today’s change, a Google search wouldn’t have found any of these photos when Singhal, his wife or anyone he’s shared them with searched for “chikoo,” which is a fruit. That’s because since the photos were private, Google couldn’t see them. Instead, if Singhal or others with access to these photos wanted to find them, they would have had to use the completely separate Google+ Search. The new feature will also work to find Google+ posts that have been shared in a limited manner, or for Google Picasa photos shared privately. Slightly confusing, you can drill-down into the results to get what Google also calls “Personal Results,” which is a way to get just content from Google+ or Picasa. Remember this from above? Clicking on the “personal results” link (or “Personal” in the options under “More Search Tools” in the left-column) brings back pure personal results.